Long distance medical transport services State to State (minimum 200 miles) by ACC Medlink, a nationwide medical transportation company offering very comfortable cost-effective, non emergency transportation services. 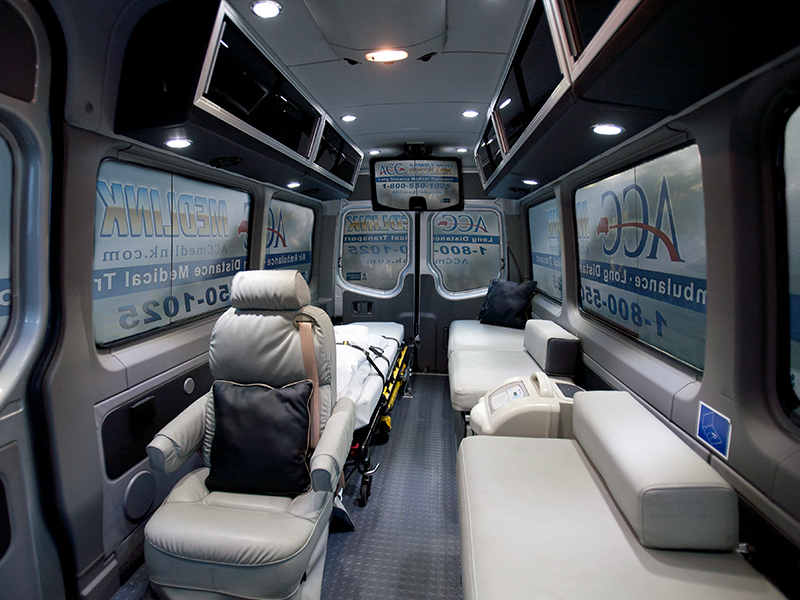 We offer the very best medical transportation service for non-emergency medical transport. We have an excellent team of drivers, medical staff and transportation specialists providing the most distinguished, yet cost effective bedside-to-bedside transportation service available. We take care of everything. Our medical transportation fleet is second to none. We operate large, state-of-the-art Mercedes Benz Sprinter transporters that are specially configured to function as a hospital room on wheels for the ultimate in luxury and comfort for our patients. Our large, nationwide fleet is expertly maintained. ACC Medlink specializes in long distance medical transport services (minimum 200 miles) and state to state medical transport services. We utilize DOT-approved vehicles that are the largest in the industry—and are equipped with three beds to accommodate family when loved ones are traveling together long distances. ACC Medlink is the premier nationwide medical transportation company. 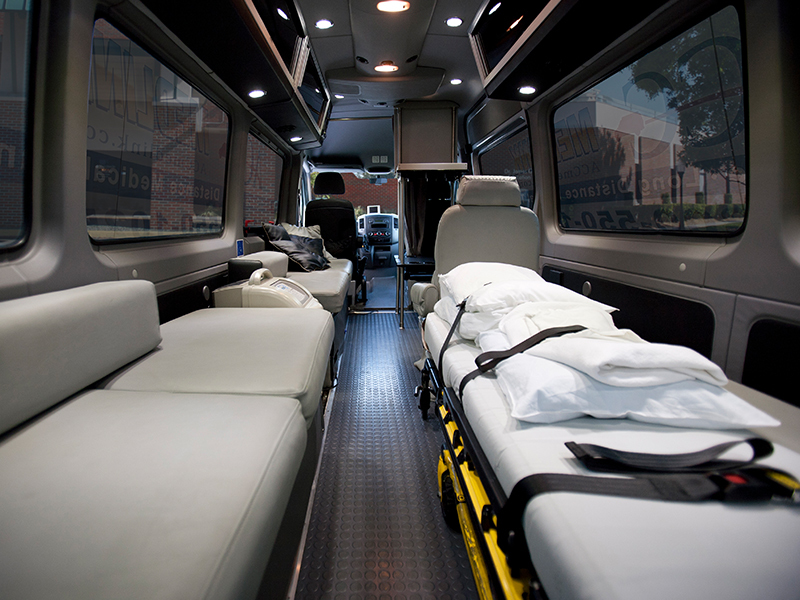 We offer state to state patient transport for non-emergency situations. Unlike the typical ambulance transportation service, ACC Medlink’s long distance medical transport vehicles are specially configured for comfortable transport of patients who can not walk or sit up for extended periods. If your destination is more than 200 miles away—we are the safest and most cost effective choice available. If you need nationwide elderly transportation or state to state ambulance service, you can trust our qualified staff to handle the patient with the utmost in care. We offer an experienced team of medical professionals and transportation specialists who work together to provide the most comfortable experience. We have an excellent track record for safely transporting our patients over long distances. Our long distance medical vans are fully equipped to meet needs and ensure the most comfortable ride. Whether restricted to a bed or able to sit up, our staff will make the necessary accommodations. We can even accommodate several family members or a pet to feel comfortable every step of the way. Our Mercedes Sprinter fleet are the only DOT approved vehicles in the entire industry for this type of transport. All it takes is one call and everything will be taken care of. Our transport coordinators are standing by 24/7 waiting to assist you with your long distance medical transport needs. You can rest assured that your loved one is receiving the top level of care. If you have any questions, give us a call at 1-800-550-1025. ACC Medlink provides the following non-emergency medical transportation services: Long Distance Medical Transport, Long Distance Non-Emergency Transport, Bed To Bed Transport, Patient Transport Ambulance, Coast To Coast Transport, Long Distance Transport With Nurse, Nursing Home Transport, Medical Transport, Transport With Passenger, Medical Transport Across Country, Home To Home Transport, Private Ambulance Transport, Hospice Transport, Central Florida Medical Transport, Medical Care Transport, Stretcher Transport, Transport For Patients After Surgery, Patient Care Transport, Medical Transports Within Florida, and Transport For Patients With Dementia, Long Distance Medical Transportation Services, Long Distance Patient Transport, Long Distance Elderly Transport, State to State Medical Transport, State to State Patient Transport, Cross Country Medical Transport, Cross Country Patient Transport, Regional Patient Transport, Regional Medical Transport, Out of State Patient Transport, Out of State Medical Transport, Long Distance Hospice Transport, National Patient Transport, Long Distance Ground Transport, Affordable Long Distance Patient Transport, Affordable Long Distance Medical Transport Trans-MedCare is a Non-Emergency Transportation Business. Please check out our long distance medical transport reviews on customer lobby. We provide the best mix of comfort and luxury for patients with safety and peace of mind for the family, ACC Medlink makes finding the perfect medical transport option a great experience for everyone. is the Most Comfortable Option in the Industry. Our Mercedes Sprinter is built to allow the patient maximum comfort. Our state of art designs make our long distance patient transport ambulance service the industry leader. Our Sprinter is the best combination of luxury and value for patients traveling with additional family, large medical equipment or even pets. Our service is very accommodating, we will take care of any special needs just inform one of our transport coordinators and they will be happy to assist you.